Back down in London again, for this year’s Fours event, with two boats out on the Saturday in the Fours Head and one on Sunday in the Masters event. Really good performances from all three crews with the Tideway showing a complete change in conditions from one day to the next. Fours HeadTwo ladies’ boats out in the main Fours Head, an IM1 quad and an IM1 coxed four. The quad, comprising Emma, Helen M, Andi and Liz, was first off. With limited practise time and this being Helen M’s first race in a crew boat for as long as I can remember, this was always more of a learning event but despite this, they put in a good time. The four also were a relatively new crew (Charlene, Paula, Lou and Alice, with Yemin coxing the Tideway for the first time) having been put together following the seat racing at Peterborough. After an “interesting” start, where they boated at Civil Service and were then told to stop at Tideway Scullers (just the other side of Barnes Bridge!) and get out to wait for their division, they got off to a steady start. Having settled, they then ramped up the pace and started closing in on the crews in front, ultimately catching and passing two boats (interestingly, one of them when being overtaken was yelling at our ladies to move out of the way!) including a local rival! They were close to catching a third but ran out of river before they could manage this but an excellent race saw them place 15th of 30 in club crews – a top half finish, something to be really proud of. Watching from the far end of Dukes Meadows, we then witnessed some of the most ridiculous rowing; returning boats were being held opposite us and allowed to cross by the marshals. As this involved crossing the racing line, you’d expect crews to really get a move on. Most did, apart from one crew (I don’t normally name and shame but York deserve a mention here). They dawdled across at a very shallow angle, until they realised there were boats racing towards them. At this point, instead of doing the sensible thing and stopping and backing down out of the way, they accelerated , making sure they hit an oncoming boat. A really horrible crunching sound ensued as they completely T-boned a ladies four; fortunately, the ladies were able to carry on (although the time they lost will have ruined any chance they had, plus there must be damage to their boat) but York were left with around two feet of bow hanging off. After paddling to the shore they were then collected by the rescue boat and ferried back down the river in a rowing version of the “walk of shame”. Unlike yesterday’s benign conditions, today was pretty foul. Grey skies, chilly and, worst of all, a brisk wind blowing from the North. Having boated, we paddled our way towards the start – a much needed opportunity to work on balance and rowing together! Going past some of the other crews we were surprised by a sudden “Go MK” call from one of them – none other than ex-member for many years, Roger, rowing for City of Bristol. The boat following us (Nottingham) were clearly very quick and were soon bearing down on us; despite a couple of good pushes, they eased through us and started to pull away somewhere around Dukes Meadows. Still, this was offset by Andi calling that we were catching a couple of other crews. As we came round by Chiswick Eyot, the wind really hit and suddenly the waves were breaking over the bows and stern and spray flying everywhere. Our experience on Caldecotte Lake helped as we just dug deep and powered through this, passing City of Bristol (with Roger) and Bedford through the rough stuff. With no-one else catching us and not making any dent on the boats in front, we then settled for the rest of the race. Hammersmith Bridge came and went and we started the long haul for home; the river had settled down a bit and conditions to the end weren’t too bad. Building for the last couple of hundred, we closed a bit on the Nottingham boat that had taken us early on (but not gone away that much subsequently) but not enough to “un-lap” ourselves. Having finished we then had the worst bit to come – don’t know about anyone else but the row back is sheer purgatory for me, especially as my shoulder was pretty well shot by now. Rowing back past Putney, we saw the most unusual sight – a quad sitting against the Black Buoy, upside down with the crew perched on the upturned hull! How they’d done this, no idea! Inevitably on the way back, we’d had the usual numpties who insisted on racing – one Thames based crew even managed to row into us, so desperate were they to get past! Finally though, after what seemed like hours, we were back at Civil Service, sitting in the inevitable traffic jam. Watching the other boats being lifted out we could see they’d all suffered with the conditions too, as huge amounts of water were pouring out as they went to heads. Pleasingly, when we flipped our boat over, there was relatively little water (although Andi reckons this is because most of it had hit her instead…). With a large proportion of the club doing the Spartan Race, our entries for this year’s St Neots Head were a bit sparse, only four boats entered. Although we picked up a couple of second places, we didn’t post any wins and (unusually) came home empty handed. Still, there were some good races and a very eventful one for the ladies’ quad. Fourth crew off in the first division, the ladies put in a strong row and set a good time for the competition to aim for. They had one of their competitors from St Neots following them and felt they’d pulled away from them over the 2.6km course and it proved so. They then had to wait all the way through to the last division for their other competitor, another St Neots boat. Unfortunately, this crew (racing as a “D” boat rather than our “C” crew) posted a time some 11 seconds quicker, pushing the ladies into second. After the previous day’s exploits at Wallingford, this actually seemed quite a short race for Steve and I, the halfway point coming up surprisingly quickly! However, our exertions did start telling towards the end and the last section from the marina to the finish was a struggle. However, we were extremely pleased with the result – we finished second but just four seconds behind Nemesis, a crew that has beaten us easily on many occasions. We do seem to have closed the gap quite a bit over the last few races, so pleasing progress. A new combination saw Iain and Roger join Steve and I in a coxed four. With Roger’s years offsetting Iain’s relative youth this put us as a “D” crew, up against another “D” from Peterborough and a “C” from St Neots. Despite a good, solid row, we were well off of the winning time, with Peterborough winning the class and St. Neots coming second. A race that can best be described as “interesting”! After a good start and getting round the twisty bit at the beginning of the course, the ladies were settling into a good rhythm when they were aware of people on the bank shouting “swimmer – get out of the way”. Being a nice, hot day, some numpty decided it would be good to go for a swim in the river – while a race was on. Paula, at stroke, got a huge surprise when a head emerged right by her blade and took a whack from it. He appeared OK and, having done an crash stop, the girls set off again. Next on their target list was a black barge – fortunately the owner shouted a warning and they were able to hold the boat up just in time. Setting off again, they picked up and went really well down past the club house, down the regatta course and turned in to the bend towards the finish. Unfortunately, Clare misjudged the bend and the quad went into the reed bank at race pace, burying the boat in as far as Paula! As we went past in the four, all we could see was Paula and the stern, the rest of the ladies completely hidden in the reeds. They did finally manage to extricate themselves (by grabbing the reed stems and pulling against them – their blades were completely tangled) and get free to finish the course. Not surprisingly, their unplanned excursion cost them a lot of time and they finished last, slowest time of the day. Still, quite an amusing episode and no harm to the boat or the ladies (but hopefully the swimmer had a big headache). Results can be found here.No photos as we were all racing in the same divisions! A very brief entry for this event – having been away on holiday this now seems a long, long time ago and I’m struggling to remember any details! The headline news was another five wins for MKRC, spread over the two days. It really shows how far we’ve come that this actually seemed a bit disappointing at the time. 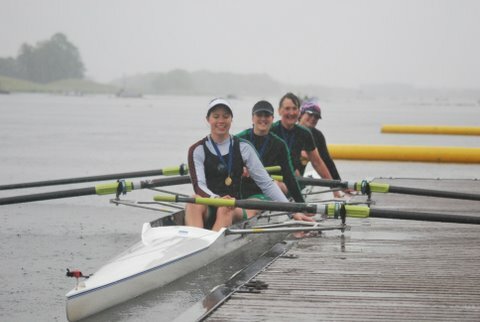 The winning boats were (Saturday) Women’s IM1 (!) quad, Elite (!!) pair and Helen M making a welcome and winning return to racing. Sunday’s wins were delivered courtesy of the IM2 coxed four and a Women’s Masters coxed four. A good turn out, especially from the juniors (including another first race, for Alex), although we again had many entries rejected through lack of competition and had to row up in many others. It’s also disappointing that so many races are now straight finals; it seems that the days of a big race programme with several rounds are gone and we are seeing a lot of very one sided finals. Hopefully, next season will be better as the new (and distinctly unimproved) points system levels out.